One of the major complaints about fiber optics is that there are so many different types of incompatible connectors. Think about it. We have simplex male-type connectors with several different sized ferrules that require mating adapters for alignment at connections. We have duplex connectors that also require mating adapters and some that are male/female and self-align. Back in the days when we ran Fotec, the fiber optic test equipment company we founded in the beginning of fiber optics, we told customers we would make adapters for any connector so they could use our test equipment. In 20 years in the business, we made adapters for about 85 different connectors! Few of these fiber optic connectors are intermateable. Test equipment generally has fixed SC or ST connectors, meaning you need lots of hybrid jumpers for reference cables. And some of these connectors are incompatible with the test equipment, meaning you cannot set the zero reference with just a launch reference cable, as called for in standards like TIA 568. In fact, with most test equipment, testing connectors like the duplex, male/female MT-RJ according to the guidelines of TIA-568 is simply impossible except using a 3 cable reference method. Contrast fiber optic's confusion with copper wiring, which uses one style of connector - the modular 8 pin connector commonly but erroneously called a RJ-45. Although there are several different performance levels appropriate for different categories of cabling systems and some incompatibilities among companies' designs, there is basically one connector. Why can't fiber optics have a single design? When I first asked that question twenty years ago, there was a reasonable explanation. Technology was moving rapidly with the expansion of singlemode fiber requiring more precise connectors and ceramic ferrules were just being introduced. All the connectors were single fiber connectors and most used epoxy/polish termination. Today, connector technology is very stable. Ceramic ferrules dominate designs, adhesive technology includes quick-setting adhesives as well as epoxy and prepolished/splice connectors are getting better. While the "old faithful" ST and SC connector continue being the most popular, only the LC of the "small form factor" connectors introduced about 5 years ago could be called a big success. But the small form factor (SFF) connector debacle in the standards committees illustrates the real problem in fiber optics - the N.I.H. syndrome. N.I.H., of course, means "not invented here." Where the discussions on standardizing on one SFF design fell apart was that no manufacturer was willing to support another manufacturer's design over theirs. 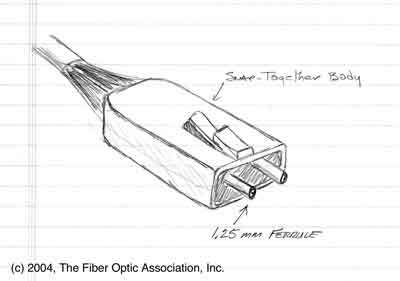 Acceptance of fiber optics would be much easier if one connector was universal. But what connector? There is probably no way the industry would accept any current design - or one from any competitor, so I decided to design one myself. It seemed that connector would ideally be a duplex connector, since every fiber optic link requires two fibers, carrying signals in each direction. Small size is also desirable, as is compatibility with both adhesive and prepolished/splice termination methods. Above all, the connector needs to be easy to accommodate with test equipment and transceivers. Why not design a small (RJ-45 sized) connector around two of the tiny 1.25 mm ferrules from a LC connector? If the ferrules extend from the end of the connector, it becomes easy to mate to like connectors and easy to adapt to test equipment or transceivers. I started sketching some crude designs. It seemed too easy. Two LC ferrules, a molded plastic body like a RJ, even an option of retractable covers for protecting the ferrules or users from laser light in high powered systems. Mating adapters are easy to build and can be modified to be instrument adapters. To me, it's a no-brainer. Get a few mechanical designers together and decide on some basic specs. Build a few prototypes and in no time you have ­ well, not the ideal connector, but perhaps a darned good compromise. How about it, all you fiber optic connector companies? You can have the design idea for free! Verizon hopes to connect 1 million customers' homes with fiber this year, another million in 2005 and 3 million in 2006. They have budgeted $1 billion this year and $2 billion in 2005 to reach these goals. Obviously, this ambitious plan is a major shot in the arm to the fiber optic industry, which must gear up to provide components and prepare installation crews to meet these goals. Let's hope SBC and BellSouth respond to Verizon's commitment by getting going themselves! Nielsen announced that as of July, 2004, 63 million Internet users, that's 51% of the total number of users, now connect over broadband - more over cable modems than DSL. The Consumer Electronics Association has adopted a new standard, CEA-2012 that provides for automotive aftermarket manufacturers to build interoperable products for the MOST network, a POF-based multimedia network now being used by many high-end automobiles. Currently, BMW, Porsche, Mercedes-Benz, Volvo, SAAB, Jaguar, Renault and other car manufacturers use MOST to incorporate navigation, radio, CD, DVD, cell phone, and other entertainment devices that are integrated with the instrument panel controls and displays. CEA-2012 allows aftermarket manufacturers to use MOST devices in separate networks or to integrate with the vehicle systems using a gateway. Here is the CEA announcement. Plastic optical fiber has always been cheap, but applications have been limited by its high loss, incompatibility with 850/1310 sources and low bandwidth. Graded index POF promised more bandwidth, and now Asahi Glass in Japan and Nexans in France have developed a new polymer fiber called CYTOP that offers lower losses of 20 dB/km at 850 nm, perfect for use with VCSELs and other standard fiber optic transceivers. The fiber also works at 1300 nm. Unlike large core POF, this has core sizes of 62.5 and 120 microns. Tests show transmission capabilities of CYTOP fiber competitive with copper in structured cabling applications.